The "Silverlight Migration Edition" is an edition of C#/XAML for HTML5 that is made specifically for individuals and companies who want to migrate their Silverlight application(s) to the web. It contains special features that make it even easier and faster to port Silverlight applications to HTML. Read below for the full list of features. 2. Go to your Start Menu and launch the app named "CSHTML5 Activation and Registration"
3. Click "Silverlight Migration Edition" and then "Start the 60-day free trial of the Silverlight Migration Edition". "Silverlight-style" project templates specifically designed for migrating Silverlight apps to HTML. 2. then you copy/paste your Silverlight classes into that new project and click "Start". Compatibility with the Silverlight and WPF namespaces. For example, the "Button" control is located in the namespace "System.Windows.Controls". This is unlike the other editions, which use the same namespaces as UWP/WinRT. For example, the "Button" control in the "Professional Edition" is located in the namespace "Windows.UI.Xaml.Controls". Silverlight migration Wizard, to automate some of the manual steps such as the creation of the folders structure and the inclusion of files "as link". Please note that manual work is still required to migrate a Silverlight application. Refer to the Silverlight/WPF Migration Guide for details. (Planned for 2019) Compatibility with the Silverlight version of some popular 3rd party controls, such as Telerik, DevExpress, Syncfusion, ComponentOne, Infragistics, and more. If you wish to contribute to accelerate the development of those features, please contact us and we will quickly send you a quotation and timeline. Proprity support. When contacting us for support, please mention the fact that you own a Silverlight Migration Edition license, and we will process your tickets with higher priority. To read about the available support options, please read the Support and Assistance section of the Silverlight/WPF Migration Guide. To try it out, just download the Free Edition, install it, launch Visual Studio, click File -> New -> Project, and choose the "Silverlight Migration Edition - Empty Application". Then, run the project. A window will appear telling you to start the free Trial. Click "Start the free trial" to continue. Where can I find more information about how to port my Silverlight application to the web using this product? Please read the Silverlight/WPF Migration Guide. You will also find more information on the product homepage, the documentation, and the forums. For the latest updates - to see what's new - please check our twitter and facebook feeds, as well as the Pre-releases section of the forums. 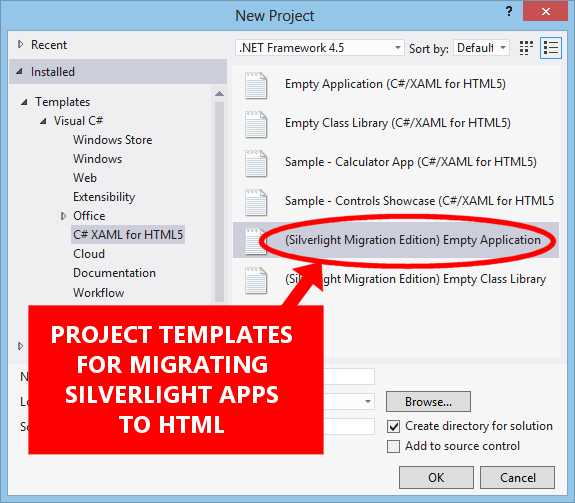 Can I use the Silverlight Migration Edition to migrate WPF applications? Yes! You can use this edition to migrate WPF applications. The Silverlight Migration Edition is preferred over the other editions because WPF uses the same namespaces, class names, and method names as Silverlight, whereas the other editions are more aligned with UWP (Universal Windows Platform) (read above for precise details on the differences). However, please note that, regardless of the edition, only a subset of WPF is supported at the moment. We are adding new features at a fast pace, as it can be seen in the Versions History page and on the Pre-Releases section of the forums.